According to a recent report from the Centers for Disease Control and Prevention, there are roughly 2 million Americans living with Type 1 diabetes, which requires daily injections of insulin. Regardless of their ability to properly dose and inject, diabetic patients must do so to treat their chronic disease and maintain their health. HUMBLE Technologies, co-founded by Bien Gutierrez, Wendy Nguyen, Krissa Tassin, Chad Bishop and Xiantong Yang, was established to reduce risks to patients and alleviate fears and intimidations associated with injections that may cause users to not comply with their medication schedules. With the unique design of the HUMBLE syringe, users can more easily ensure proper dosing, purge air bubbles and prime injections than with a traditional syringe. The idea for the syringe came from HUMBLE Technologies CEO Gutierrez, who received his bachelor’s degree in biomedical engineering from UCI, after recalling the problems he faced as a young teen tending to his diabetic grandfather and realizing syringes should be more user-friendly. But work on the HUMBLE syringe did not begin right away. Gutierrez first shared his idea for the syringe with Nguyen, HUMBLE Technologies chief operating officer, and after neither found interest in the projects available in their senior biomedical engineering design class, Nguyen pushed Gutierrez to develop his own project. “Instead of spending time working on someone else’s project, why don’t you work on that,” said Nguyen, recalling her conversation with Gutierrez. 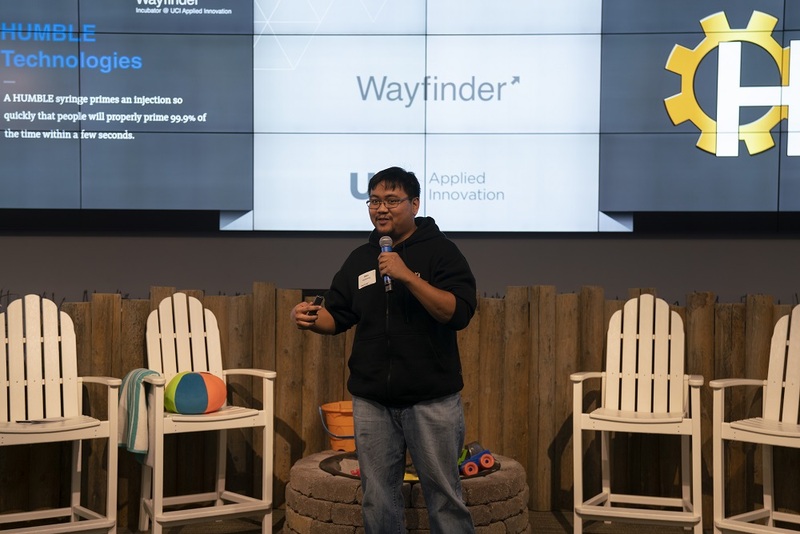 Since then, the startup has participated in UCI Applied Innovation’s Wayfinder and I-Corps programs and has placed in numerous competitions, including the Beall Student Design Competition at the Henry Samueli School of Engineering. HUMBLE Technologies is continuing to develop their intellectual property and has their sights set on FDA 510(k) approval. HUMBLE Technologies is not stopping at syringes, however; they aim to position themselves as an innovator of medical tools and devices in need of upgrades to better match the ever-changing healthcare landscape. “The big message I want to send out there about my product is this: Someone out there is thinking about healthcare transitions and support is coming,” said Gutierrez. For more information about HUMBLE Technologies, click here.